Formed in 1968 in Los Angeles, California, by the brothers Patrick Vasquez (bass and vocals) and Lolly Vasquez (guitar and vocals), the name Redbone itself is a joking reference to a Cajun term for a mixed-race person, the band's members being of mixed blood ancestry. The band referenced Cajun and New Orleans culture many times in their lyrics and performing style. Pat and Lolly had previously performed and recorded under the stage surname Vegas, in part to downplay the Latin American association of their birth surname, Vasquez. Redbone played primarily rock music with R&B, Cajun, Jazz, tribal, and Latin roots. Their first commercial success came with the single "Maggie" from their second album, Potlatch, in 1970, and two other hit singles followed - "The Witch Queen of New Orleans" (1971, #21 on the Billboard Hot 100) and "Come and Get Your Love" (1974, #5 on the Billboard Hot 100). "Come and Get Your Love", written by Lolly Vasquez stayed in the Billboard chart for 24 weeks, and was awarded a gold disc by the R.I.A.A. on 22 April 1974. Lolly Vasquez was one of the first guitarists to make extensive use of the distinctive Leslie rotating speaker effect in his electric guitar amplification set-up. Vegas played improvised, jazz-influenced guitar. Drummer Peter DePoe (born 1943, Neah Bay, Washington) is credited with pioneering the "King Kong" style of drumming, which features sharply accented polyrhythms involving the bass and snare drums and is similar to funk styles of drumming. The band referred to DePoe's "King Kong Beat" in their lyrics to the song "Prehistoric Rhythm" on their debut album. 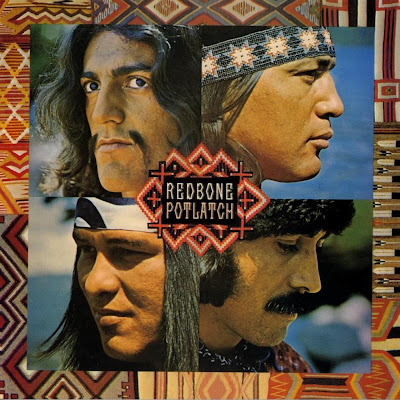 In 1973 Redbone released the politically oriented "We Were All Wounded at Wounded Knee", recalling the massacre of Lakota Sioux Indians by the Seventh Cavalry in 1890. The song ends with the subtly altered sentence "We were all wounded 'by' Wounded Knee". The song reached the #1 chart position in Europe but did not chart in the U.S. where it was initially withheld from release and then banned by several radio stations. Original drummer Peter DePoe left to be replaced by Butch Rillera. Following this the band achieved much of their commercial success. Tony Bellamy (guitar, piano and vocals) was later forced to retire due to illness. The band's current remaining membership is led by Pat Vegas alone (Lolly left in 1995, Tony Bellamy sometime after that), Raven Hernandez (guitar, vocals and songwriter) joined Redbone in 1996 to replace Lolly Vegas after he suffered a stroke that left him unable to tour with the band. Although Redbone has had some limited activity in recent years, their songwriting and touring output is slight compared with that of the early 1970s. A proposed reunion tour in 2003 did not occur. Evidence suggests the existence of an "imposter band" illegally touring the United States and posing as Redbone under the name (or alias) "Denny Freeman". Freeman, who Pat Vegas confirmed to be unaffiliated with Redbone in an interview with the Montana Standard, most recently defrauded the county-fair board of the Butte Silver-Bow County Fair in Butte, Montana under pretenses of being a co-founding member of Redbone, yet he was never a band member. Prior to forming Redbone, Pat and Lolly Vegas released an album in the mid 1960s entitled Pat & Lolly Vegas at the Haunted House (Mercury MG 21059/SR 61059). Of the twelve songs on the album, six are originals by the Vegas brothers. Pat and Lolly Vegas also released several 7" singles from 1961 to the mid 1960s. One of them is titled "Robot Walk" / "Don't You Remember" (Apogee Records A-101). The first self titled album by Redbone was released as a double album in North America and as a single LP in Europe. Their third album, Message from a Drum, was released in Europe with another title (The Witch Queen of New Orleans) and a different cover than the one released in the U.S. and Canada. One of the 1970s drummers, George Spannos, released his own hit album Passion in the Dark in 1983 under the name Danny Spanos, having a Top 40 hit single with "Hot Cherie". Redbone was inducted into the Native American Music Association Hall of Fame in 2008.